TV One will demonstrate their brand new and all-powerful CORIOtools Suite at the InfoComm 09 Exhibition being held June 17-19 in Orlando, Florida. Designed to give effortless control of the vast range of premium-quality CORIO2 products, TV One shows once again their commitment to providing the ultimate solutions to the most demanding requirements of the Professional AV and Broadcast markets. The new CORIOtools Suite has been developed by TV One to provide simple application based PC control of a single CORIO2 device or simultaneous control of multiple units, allowing for transparent command of combined modular systems and cascaded products. This allows for more efficient control of the increasingly complex systems and solutions that are rapidly becoming more commonplace in today’s advanced technical environments. The CORIOtools Suite is supplied free of charge as a base application that provides the ability to save and restore various settings within single or multiple units and a range of application based plug-ins can be added to it as required. 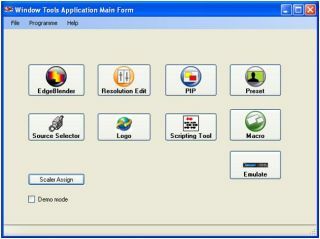 This plug-in based approach ensures the simple expansion of the software without affecting the application reliability. These plug-ins will allow control and adjustment of a wide range of advanced features and applications that are available on CORIO2 products such as presets, macros, logos, resolutions, source selection, edgeblending and picture-in-picture windows. To see a demonstration of this exciting new feature, visit TV One Booth 3724 at InfoComm 09 in Orlando, Florida, June 17-19.